Braza Australia was started by Stuart Campbell in 1995, as a division of Heatherdale Group Pty Ltd. 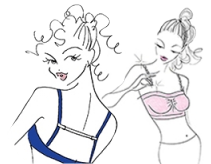 The aim of the company is to distribute throughout Australia high quality Lingerie Accessory products sourced from the Brazabra Corporation of Lee, MA, USA. Not all products from Brazabra Corporation are suitable for the Australian market for a variety of reasons, some being the level of import duty, imported price too high or patent conflict. Sign up to our newsletter to receive updates and special offers into your inbox.